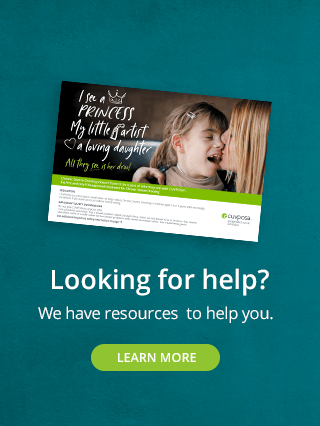 We have resources to help you. 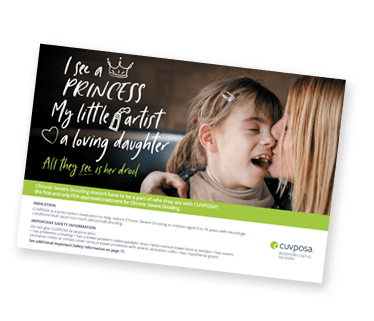 CUVPOSA is a prescription medication to help reduce chronic severe drooling in children aged 3 to 16 years with neurologic conditions that cause too much (abnormal) drooling. 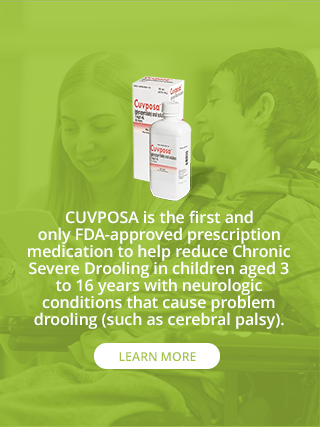 Uses Cuvposa is a prescription medicine used in children aged 3 to 16 years with medical conditions that cause too much (abnormal) drooling. Constipation. Constipation is common with CUVPOSA. Tell your doctor if your child strains with bowel movements, goes longer between bowel movements, cannot have a bowel movement, or if their stomach is firm and large. The dose of CUVPOSA may need to be decreased or stopped. Diarrhea and intestinal blockage. Diarrhea can be an early symptom of a blockage in the intestine. This is especially true if your child has a colostomy or ileostomy. 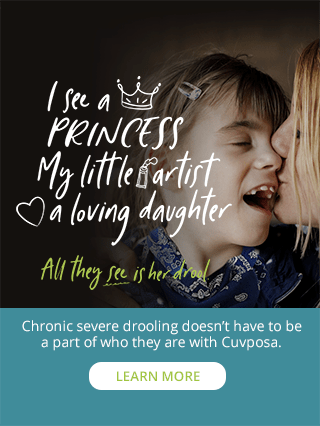 Tell your doctor if your child has any diarrhea while taking CUVPOSA. CUVPOSA may cause sleepiness or blurred vision. Do not drive a car, operate heavy machinery, or do other dangerous activities while taking CUVPOSA. Tell your doctor if you have any side effect that bothers you or that does not go away. These are not all the possible side effects of CUVPOSA. For more information, talk to your doctor. is pregnant or plans to become pregnant. It is not known if CUVPOSA can harm an unborn baby. is breastfeeding or plans to breastfeed. It is not known if CUVPOSA passes into breast milk and if it can harm the baby. Tell your doctor about all of the medicines that your child takes, including prescription and non-prescription medicines, vitamins, and herbal supplements. Some medicine may affect the way CUVPOSA works, and CUVPOSA may affect how some other medicines work. 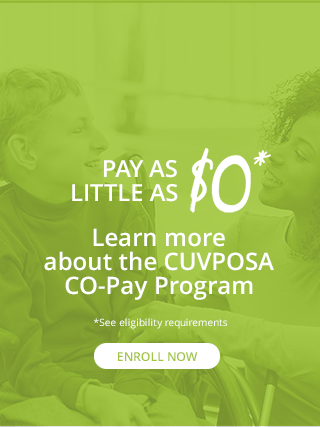 Give CUVPOSA exactly as prescribed by your child’s doctor. Give CUVPOSA 1 hour before or 2 hours after meals. Your doctor will tell you how much (milliliters or mLs) of CUVPOSA to give your child. Do not change the dose of CUVPOSA unless your doctor tells you to. You must measure the dose of CUVPOSA before giving it to your child. Use a special marked dose measuring cup (available at most pharmacies) to measure the right dose of CUVPOSA. To help make sure that your child swallows the dose, you should use an oral syringe to give the child each dose of CUVPOSA, after you measure the dose needed with a dose measuring cup. Oral syringes are also available at most pharmacies. If you have questions about how to measure the dose or how to use an oral syringe, ask your pharmacist or doctor. The dose of CUVPOSA that is needed to control drooling may be different for each child. CUVPOSA is usually started at a low dose, and slowly increased as directed by your doctor. This slow increase in dose continues until the best dose for your child is reached, to control drooling. During this time it is important to stay in close contact with your child’s doctor, and tell the doctor about any side effects that your child has. See "Warnings". Inactive Ingredients citric acid, glycerin, natural and artificial cherry flavor, methylparaben, propylene glycol, propylparaben, saccharin sodium, sodium citrate, sorbital solution, and purified water. CUVPOSA® is a registered trademark of Merz Pharmaceuticals, LLC. ©2018 Merz North America, Inc. All rights reserved.